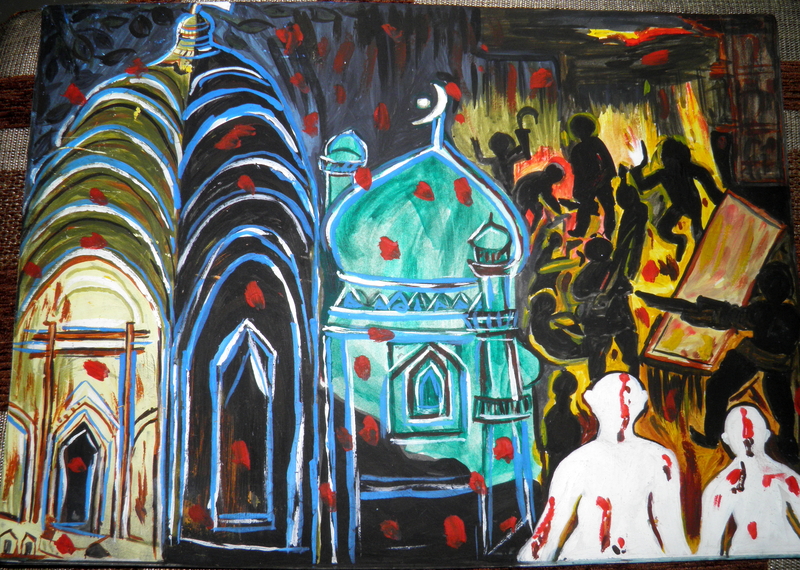 An oil painting by my mother Dr.Meera Verma depicting the communal riots…. This folk song is another one of my Ma’s favourite songs…recently attended a family wedding and this song has since then been on my mind so posting today…. Why did you marry me off to a foreign land ? We will go wherever you lead us…..
And a foreign-land to me……. My homeland is left behind…..
What do you sing now Dear Koyal? As I leave for a foreign-land…. Recently famous Indian Singer Shamshad Begum left all of us at the age of 94 for her heavenly abode. We held a programme remembering her. In this video, Dr.Ila Prakash speaks about Shamshadji and I sang her song “Bachpan ke din.’ Posting the lyrics and their English translation below….